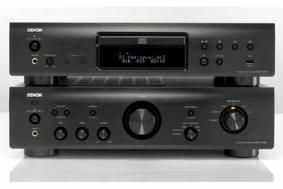 Denon adds more models to its Advanced Evolution hi-fi range | What Hi-Fi? Selling for £350 apiece, the new models combine proprietary Denon technology and extensive European tuning. The player uses the company's AL24 Processing analogue waveform recreation technology, and high-accuracy DACs and master clock. It also has a USB input for digital input from an iPod or USB memory stick. The amplifier has a High-Current Single Push-Pull Circuit, a high-power circuit layout and an internal construction designed to keep unwanted vibrations away from the audio signals. It delivers 50W per channel, has a moving magnet phono stage and provides preouts to enable it to be used with an external power amp. Both products are available in silver or black.